Do you want let your iPhone,iPod Touch change to a powerful video recording tools? Download NOW. Driving Record is a nice tools to record the videos, photos, traces while you are driving, the frame rate can be 1920x1080-iPhone 4S, 1280x720-iPhone 4, etc., also this is a cool tools to record your trace for some one who like journey, they can share the trace to your family, your friends. Let them happy for you. 1.1 Can display and record the time, GPS, Speed and Accelerometer information in the video. 1.2 Set the frame rate as your wish. 1920x1080-iPhone 4S, 1280x720-iPhone4, 640x480 or lower for the iPhone 3 or iPod, even an older device can use this APP. 1.3 Can take photo at any time while recording, don't lose any beautiful view and accident. 1.4 Mute recording. Don't want recording the voice? OK, no problem, the mute recording can protect your privacy. 1.5 Separate recording. Every recording can be set to 1 minutes, 5 minutes also ten minutes. 1.6 Close the screen for saving your power. 1.7 Don't worry the incoming call, the APP will store the recording and restart the recording when call is over. 2.1 Can automatically take photo while the recording video in some time. 2.2 The photo will also contain the time, GPS, speed and accelerometer information. 2.3 Take photo manually, can not lose any beautiful view and accident. 2.4 Take photo by gravity sensing. 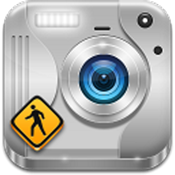 APP will continua take photo automatically if emergency brake or hedge. 2.5 10 seconds, 20 seconds or 30 seconds, can set any time period for auto taking photo. 3.1 Can record the trace while the video is recording, and make the annotation for every video. it easy to management. 3.2 Don't record the video, just want record the trace, OK, no problem, you can do this. 4.1 Manage your trace, Where is the start? where is the end? all of thing in one map. 4.2 Share your trace with your family , your friends, let them happy for you.